The Prankster has been given this report from a British Motorist Protection Association representative. On 9/1/2015 in Bristol HHJ Roderick Denyer QC heard the directions hearing for two related cases, Civil Enforcement Limited v Curtis A93YM708, and DEAL v Colclough A79YP365. Mr Ritchie was there for CEL and Mr Fealey for the defendants. DEAL was not represented. Also present were representatives from the Coop, who were apparently funding the defence. Although ostensibly a parking case the judge hinted that there was a large back-story which he was not concerned with at this moment in time. Apparently there was some contractual disagreement between CEL and the Co-op, which resulted in the parking contract being terminated, CEL finally moving out on December 19th. CEL retaliated by ticketing Co-op employees then refusing to cancel tickets, with the result that CEL (and their debt collectors DEAL) currently have 50 court claims on the go against Co-op employees. In the hearing, the Co-op were seeking a part 19 (rules 10 and 11) agreement (group litigation order) so that all the cases could be heard together rather than scattered all over the country, and so that new cases could also be added. HHJ Denyer explained that although he initially leaned towards the order, he did have his doubts, especially as to how the administration would work. He would prefer a different solution. Mr Ritchie suggested a test case could be heard. Mr Fealey explained that the claimants conduct so far was an indication of the nature of the beast. In the papers already submitted CEL had suggested that the test case be CEL v Ms Ferris which has already been held. However, in that case the papers had been submitted to Co-op funerals rather than Co-op stores, which resulted in the Co-op legal team not turning up. They were therefore currently seeking a set-aside for that case, which was objected to by CEL and that case was therefore not suitable to be a test case. HHJ Denyer stated he had seen the letter CEL wrote to Ms Ferris. He explained this was no slight on Mr Ritchie as he was not involved, but he had serious concerns over the letter, which he stated was 'a disgrace'. He explained to Mr Ritchie 'The correspondence [to motorists] from your clients and DEAL does not make entirely happy reading'. However a test case would save court time if suitable directions could be found. He explained there was a third party, Creative, and that the Co-op's contract was with Creative rather than CEL, although this was a simplification. Mr Fealey stated that the upcoming appeal case of ParkingEye v Beavis may sort out a lot of the issues in this case and that nothing should proceed until then. Mr Fealey also pointed out that the nature of the people the court were dealing with was that they had opposed the stay of this case, CEL v Curtis until after this directions hearing, and he feared there may be more of the same in the absence of good faith cooperation. After some discussion and breaks for Mr Ritchie to take instruction from CEL, HHJ Deyner gave his judgment. The 50 outstanding cases would be stayed until at least 31st of March. If the co-op identified any more cases involving employees, then CEL agree to stay these too. The two claims discussed today would be used as test cases and moved to the multi-track, to be re-listed as soon as possible after 23 January. Directions could be applied for, which may also include asking for a stay until the Beavis appeal. CEL seem to be slitting their own throat. What sensible company would employ them to manage their car park after learning how they have acted in this case? The Co-op also seem to be in something of a Morton's Fork. If they win their case then all car park charges in their stored may have been invalid. This may lead them open to claims from customers going back to the start of the contract. Moving forward, they will have to find a way of managing their car parks which is legitimate. The Prankster suggests they engage an operator on a fixed fee basis, and make sure charges are not penalties. Meanwhile, anyone with a Co-op parking charge should note that the Co-op have a contract with Creative and not Civil Enforcement Limited, and therefore this needs to be examined further to establish if Civil Enforcement Limited have the right to issue charges. Lastly, anyone with a court case with Civil Enforcement Limited should ask for it to be stayed until the test case of Civil Enforcement Limited v Curtis A93YM708 is heard. Anyone with a court case with DEAL should ask for it to be stayed until the test case of DEAL v Colclough A79YP365. The Prankster also wonders who will sign the landowner witness statement in this case. 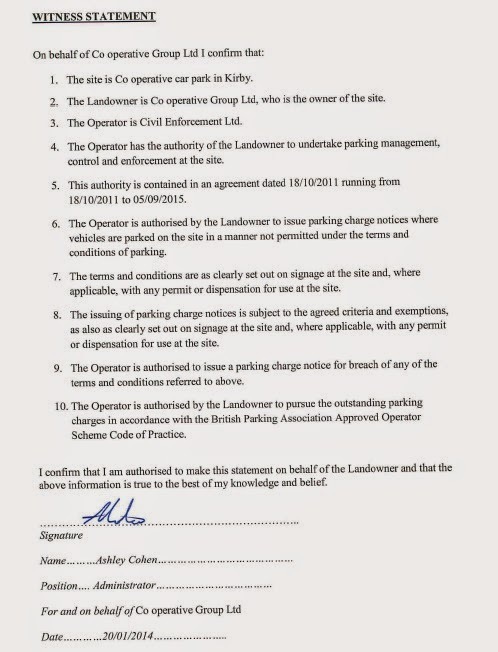 Previously, Ashley Cohen of CEL has signed these as an administrator on behalf of the coop, although the Co-op has denied he has authorisation to do this. Co-op legal team have only themselves to blame. Dozens of defendants contacted Co-op and asked about the contract when an angry CEL started bringing claims against their customers. They could have given a straight answer. Instead they refused "on legal advice" and a naive customer service paid off many of the claims. Unfortunately, vulnerable Co-op workers bear the brunt. Am I reading this right? CEL are pursuing Co-op employees even though Co-op - presumably the land owners - have instructed them to drop the cases? The image of a slavering pit bull fastened solidly onto its owners arm springs unbidden to mind. It's a shame we can't add images to these comments as I know a few good ones all starting with WTF. I just hope this doesn't get fudged. 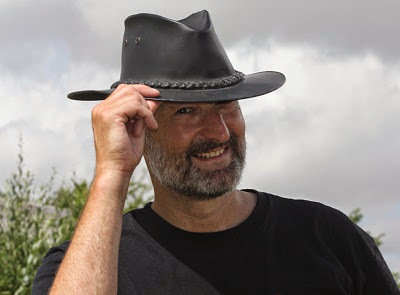 It could be a really nasty bite in the 4rse if CEL are given priority over the rights of the landowner and could set a very dangerous precedent. On the other hand, it could also sink CEL, even should they win. In fact if they win it would be worse for them since their flag will have been raised and future potential contracts may well slide under the table as a result. Who would want to work with these stupid gits? Co-op, you got the Reverend Paul Flowers as a result of your navel contemplation, then along came CEL. Or perhaps they came along as a result of something Reverend Paul Flowers did. Have you mixed up Mr Ritchie and Mr Fealey? The quotes from Mr Ritchie seem to make more sense coming from the defence, not from CEL's representative...? Are Smart Parking the next ParkingEye?